David and I have a love for big cities and we were anxious to make a city trip together. Most of you know he goes to school at Trinity in Deerfield - just north of Chicago. Because the commuter apartments he usually rents are being remodeled, David has to stay in a hotel every week. Thank goodness for priceline! He waits until later in the evening to put in his bid and gets a very awesome price - just about the same he was paying for on campus housing! He never knows which hotel he'll get, of course, but that's part of the fun.So... we figured two can stay as cheap as one! Mom Fry kept the kids and I hopped in the car with David when he headed up to Deefield for school. The suite reminded us of our honeymoon suite. They served a fantastic continental breakfast in the atrium. (We're not talking stale donuts. We're talking fresh mangoes, gourmet granola, a personal pot of coffee. I just love 3-star living at a 1-star price. Heading into the train station to get Metra tickets for traveling into the City. We can't wait to take our kids on this smooth double decker train. There are so many things to watch! Union Station - An experience all its own. I want to go into detail but I'll refrain. Loved all your photos and comments. Some of those places brought back pleasant memories of our visits to the Windy City. Thanks for sharing! Darling, every mama needs some quietness, and a quick getaway. I'm so glad you got yours!! gotta love it. Isn't it exhilarating to visit the city? 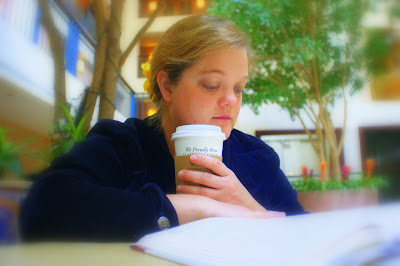 Your "alone time" pic is cute and made me want coffee and an atrium! The time alone pic and description was great - thanks for the smiles!! The picture of you is soooo cute! Does not look like a self photo at all! You must visit Seattle. One of my favorite big cities.